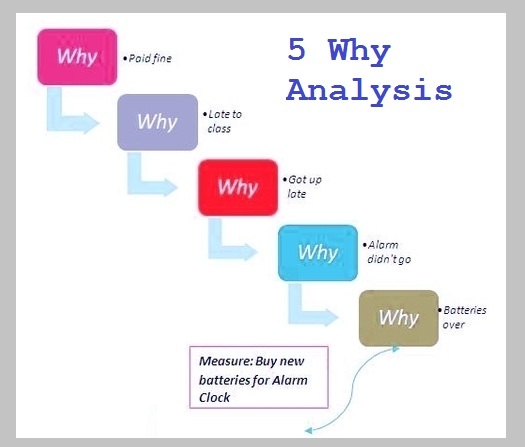 5 Why – 5 Why Analysis – Five Why – 5 Why Framework – 5 Why Business Methodology – 5 Why model is one of the fundamental lean six sigma frameworks and is essential in looking for the root cause of waste and business challenges. Level after level, 5 WHYs are meant to unpeal symptoms to get to the root cause of an issue. The limit is placed on a number five because looking beyond may not be as viable and will probably go as far as a psychological issues of the business owners; Lean recognizes that psychology is not its competence 🙂 and that the focus is to be at a business level. Below sample images are examples of 5 Why-s used in business management. 5 Why Analysis - this diagram visually depicts one of the common business frameworks, used by leaders to develop company strategy, tactics, models and approaches.